From award-winning digital marketing to website design and custom application development, SilverTech identifies opportunities to maximize revenue, performance, profit and results. Its full range of digital lifecycle services — including business intelligence and analytics, CMS and systems integration, content and social strategy, managed hosting, marketing automation, responsive design, SEO and more — deliver user experiences and digital marketing strategies that drive customers from lead to loyalty. While serving a second tour in Iraq as an intelligence specialist with the NH Air National Guard, Kevin Kurland, a 50-year-old mechanical engineering graduate from the University of New Hampshire, read an article in The Wall Street Journal about the emerging boom in craft liquors. By May 2014, he and four other veterans in his family had opened Smoky Quartz Distillery in Seabrook. The name of the popular V5 Bourbon — which accounts for 50 percent of company sales — is a tribute to the veteran teamwork ethos that Kurland said is the fundamental strength and a point of pride for his business. A $1.8 million public-private partnership fund consisting of 40 individual investors and the New Hampshire Business Finance Authority, Millworks Fund II is providing extra capital for startups in New Hampshire. Millworks II has committed to provide $600,000 per year for three years to New Hampshire startup companies through the New Hampshire High Technology Council’s annual TechOut competition and through Alpha Loft’s Accelerate NH program. Investments have been made to biotech company Kantum Diagnostics Inc., software company Datanomix, builder and workflow software company addapptation, construction customer relationship management tool Thunderbolt Pipeline and Pulse, a community-based survey platform. Powered by 50 students who are selected through a competitive application process, DALI — an acronym for Digital Arts, Leadership and Innovation — provides an extracurricular experience for students to learn coding and design through applying it to approximately 10 projects each term. Projects can be introduced by faculty members, students or businesses that contract with the lab. DALI has developed a wide range of technology solutions, from a tool to illustrate a professor’s research on how proteins work together to a 360-degree virtual reality system for NASA’s National Space Biomedical Research Institute to provide a psychological escape for individuals in long-duration space flight or working in the Arctic. A national education nonprofit, Project Lead The Way provides curriculum pathways to expose students of all ages to engineering fundamentals, analysis, technical writing, coding, electrical circuitry and computer-aided design. It also builds skills across the board that employers desire, such as collaboration and critical thinking. Launched in New Hampshire in 1998, one year after its founding, Project Lead The Way’s programs have spread to approximately 47 schools in New Hampshire in the form of elementary, middle school or high school curricula. Supported by an $80 million Department of Defense grant and $200 million investment from research universities, organizations and private companies, the Advanced Regenerative Manufacturing Institute’s BioFabUSA program aims to advance the bioengineering industry, with the goal of supplying severely injured soldiers with replacement organs, skin tissue and even blood. By working closely with UNH Manchester to develop a greater bioengineering workforce, ARMI has the potential to redefine the industry culture of Manchester and make New Hampshire a destination for 21st century innovation. Through regional offices and satellite locations, the New Hampshire Small Business Development Center has offered free, confidential, business management advising and educational programs to more than 94,000 New Hampshire entrepreneurs, helping them to start over 2,000 businesses and create more than 7,000 jobs since 1984. Clients from all sectors seek the SBDC’s advice on financing, improving operations, business sustainability best practices, bringing new products to market and where to start in launching a new business or purchasing an existing one. Founded as a 501(c)(3) organization in Nashua, MakeIt Labs not only provides tools and a maker community but also has a bunch of motivated volunteers who travel to classrooms around Southern New Hampshire to get kids interested in STEM. If a school doesn’t have a 3-D printer, MakeIt Labs will provide them for the activity. Kids also light up when they see fellow member Tom Doucet’s self-made, life-size R2-D2, the “Star Wars” robot. 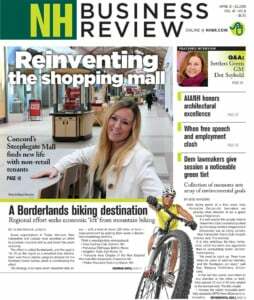 Founded in 2015 by longtime NH Union Leader reporter Nancy West, InDepthNH.org has slowly gained a foothold with its reporting and dexterity to survive in a challenging economic environment. The InDepthNH.org news site is published by the NH Center for Public Interest Journalism. Its mission is to enhance independent journalism, hold government accountable and stir public debate on a wide range of issues. It was, however, a startling investigative story late in 2015 by West that helped elevate InDepthNH.org’s stature. Due to program restrictions at the NH State Hospital, the public and many New Hampshire lawmakers were stunned to learn the state was housing more than a dozen male and female non-criminal mental patients at the State Prison psychiatric unit for the criminally insane. New Hampshire is expected to follow suit with other New England states in designating the full 15 percent of settlement funds for electric vehicle infrastructure. This rare investment opportunity could help businesses build EV infrastructure for their employees and in return allow energy from charging cars to be repurposed for other energy needs, redefining the way we think of and access energy. With 45 affordable housing units available in the newly renovated, former Franklin Light and Power Mill and improved branding of Mill City Park, a whitewater rafting park, the City of Franklin is undergoing a transformation. At the helm are Todd Workman and Marty Parichand – two individuals who have spent much of their personal time, financial investment and good ol’ Yankee spirit to revitalize Franklin, attracting tourists and millennials. PermaCityLife, a nonprofit founded by Workman with a relationship to Colby Sawyer College, assists with furthering along Franklin’s potential. Magdalena Randall came to the United States from Poland in 2003, dreaming of having a business of her own. While raising her young children, she’d sell European-style bread at a farmer’s market, and got the attention of Greg Cloutier, a businessman who offered to rebuild a burned-out store on Main Street in Lancaster if she wanted to rent it and open a bakery. By working with an expert baker to help with equipment selection and forming a financial plan with the Small Business Development Center, Randall opened the Polish Princess in 2015, fulfilling her dream. Early care and education programs tuition rarely covers the cost of high-quality programming. Since 2014, the NH Community Loan Fund’s Business of Child Care has provided technical assistance and hands-on training to early education and child care providers in targeted regions of New Hampshire. For many child care organizations, this programming provides the only opportunity for them to review best-practice guidelines for business operations and governance. The Business of Child Care Initiative was launched with funding from the Neil and Louise Tillotson Fund of the New Hampshire Charitable Foundation, with continued efforts supported by NHCF, the Norwin S. and Elizabeth N. Bean Foundation, Couch Family Foundation and the Byrne Foundation. The Milford School District takes STEAM seriously. Collaborative efforts amongst middle school and high school teachers to combine projects in subjects such as art and engineering and Milford’s much acclaimed STEAM Nights demonstrate educators’ commitment to inspire students and develop forward-looking curriculum. Led by engineering teacher Frank Xydias, STEAM Nights introduce students to science, technology, engineering, art and math through workshops led by New Hampshire businesses, helping bridge the gap between industry and educators – and showing students the career opportunities here in New Hampshire. After starting a hugely successful authentic Italian cuisine company, Joe Faro is now having a hand in what will be one of the biggest real estate developments New Hampshire has ever seen. For the last few years, he’s been working to redevelop the former Rockingham Park property in Salem into what will be the 170-acre mixed-use Tuscan Village. Some of the highlights include a roughly 200-room hotel, dozens of storefronts and standalone retail spaces, a small lake that can be used for recreational activities and walking paths throughout the property. Technology Seed was founded 18 years ago on a mission to prevent IT problems and improve efficiency for small businesses. With Technology Seed, clients reduce the cost of IT while increasing businesses productivity. And its Certified Ethical Hackers on staff are well-versed in IT security, HIPAA compliance and PCI compliance. Technology Seed also provides cloud strategy and migration and offsite server back-up for customers throughout the Northeast, the mid-Atlantic and worldwide. Accurate Title offers flexible closing options for clients’ convenience such as e-mailed documents, closings through express mail and closings at any of its four New Hampshire locations. From beginning to end, Accurate Title keeps all parties involved in a transaction informed and explains everything upfront thus minimizing confusion and surprises at closing. Beginning in 1987 with one route, Green Mountain Messenger has grown to over 100 daily routes and become a full service provider of courier and same-day delivery services in the New England region. With New Hampshire offices in Londonderry and West Lebanon, GMM’s dedicated management team of experienced problem solvers has provided its customers with cost effective and efficient transportation solutions resulting in a solid base of long term-satisfied customers. Set amongst the pristine, rolling hills, the Atkinson Resort & Country Club has been a place of solitude for city travelers since the 1800s. In addition to the 18-hole par 72 public golf course, is a practice facility designed to help golfers improve their game. The facility consists of 15,000 square feet of grass tees, 12,000 square feet of putting greens, multiple bunkers and a 65-yard short-game practice hole. The largest credit union in the state, Service Credit Union combines the warmth and attention of a credit union, the security and support of a big bank and a constant eye to the future to create a financial institution that’s always working, always innovating and always looking out for its clients. Service Credit Union provides advanced security, a broader range of competitive products and services as well as educating members on how they can get the most out of their money. Founded in 2003 with five New England offices including a location in Concord, ReVision Energy is a renewable energy contracting company that provides a full range of engineering, design, installation and equipment service for homes, businesses, municipal buildings and nonprofits. A registered benefit corporation, ReVision prides itself on being a mission-driven company that makes a substantial effort to embody its values in every interaction with customers, suppliers and the community as well as amongst its staff. Ford Flower Co. is the premier flower shop for all Salem flower delivery services, with a wide range of selection of plants and gift baskets for all occasions. Ford Flower will create and deliver any beautiful flower arrangement, including sympathy flowers. Flower delivery is available in Andover, Atkinson, Derry, East Derry, East Hampstead, Hampstead, Haverhill, Lawrence, Londonderry, Methuen, North Andover, North Salem, Pelham, Salem and Windham. Scheduled to take place Friday, Nov. 2, 2018 in Manchester, the annual New Hampshire Conference for Women provides an opportunity for women (and men) to listen to motivational speakers while forming peer-to-peer connections and furthering personal and professional development. Attendees in positions ranging from domestic goddess to administrative assistant to CEO make up the group of dynamic, fabulous women. The conference is just one of many events organized by the member-based organization Women Inspiring Women. From payroll and bookkeeping to document management, Business Cents has all the support business owners need to free them up from burdensome tasks so they can concentrate on making their business thrive. Business Cents will accommodate traditional and non-traditional needs, providing a personalized service and security that ensures business logistics are in capable hands. Since 1984, Office Alternatives has carried everything you need for your office environment, from office chairs and seating, used filing cabinets and storage, used cubicle systems and panels, workstations and more. Headquartered in Maine with nine offices in New Hampshire, Cross Insurance Agency offers experience in all facets of insurance protection — and more than 400 knowledgeable employees — so it can always assemble the team best suited to meet its clients’ business and personal insurance needs. Its business products are tailored for a range of industries and include property, general liability, business interruption income, commercial auto, workers’ compensation, cyber liability, professional liability and more. Its fully staffed employee benefits division represents more than 1,500 employee benefit clients throughout Maine, New Hampshire and Massachusetts, and each client is assigned a minimum of two Cross representatives: an account executive, whose principal responsibility is front-line contact, and a benefits specialist, working in a day-to-day fashion with each client. The cornerstone of the Elliot Health System — the largest provider of comprehensive health care services in southern New Hampshire — is Elliot Hospital, a 296-bed acute care facility in Manchester. Established in 1890, the hospital offers surrounding communities caring, compassionate and professional patient service regardless of race, religion, national origin, gender, age, disability, marital status, sexual preference or ability to pay. The hospital is Greater Manchester’s designated trauma center, and is also home to a cancer center, urology center and has one of only three Level 3 Neonatal Intensive Care Units in the state. Anthem BlueCross and BlueShield, New Hampshire’s largest health benefits company, is a member company of WellPoint Inc., whose mission is to improve the lives and the health of the people and the communities it serves. The company delivers a number of health benefit solutions through a broad portfolio of integrated health care plans and related services, along with a wide range of specialty products, including pharmacy benefit management, dental, vision and flexible spending accounts. A wholly owned subsidiary of RAM Printing Inc., Hampstead Print & Copy is a full-service copy center offering the best in precision color and black & white copying, printing and output for personal and business needs. Hampstead offers a variety of binding, collating, laminating and other finishing services as well as items including personalized mouse pads, T-shirts, coffee mugs and other fun gifts. RAM Printing, is a family-owned and operated, full-service offset printing company with over 30 years servicing the printing and imaging needs of business, industry and the design trade throughout New England. RAM Printing handles everything from stationery to annual reports, from state-of-the-art pre-press to enterprise-wide fulfillment, and from file management to imaging innovation. Located in southern New Hampshire, RAM Printing services all of greater Boston, New Hampshire and southern Maine. For more than 20 years, AutoFair has served New Hampshire and surrounding areas as a new and used auto dealership. With services such as an online Car Finder, AutoFair’s Ford, Honda, Hyundai, Nissan, Volkswagen, Subaru and pre-owned dealerships work hard to make the vehicle shopping experience an enjoyable and memorable one. AutoFair also takes pride in serving the community, and is a founding member of the Manchester Charitable Foundation. At AutoFair, a friendly sales staff is always on hand to exceed customer’s expectations with world class service and exemplary knowledge. Companies will find over 3,000 vehicles including Honda, Ford, Hyundai, Nissan, Volkswagen and Subaru ready for immediate delivery. There’s also a large inventory of certified pre-owned vehicles to choose from. Named in honor of New Hampshire entrepreneur Paul J. Holloway, the Holloway competition is open to all students of the University System of New Hampshire. Established in 1988, the competition presents cash awards to winning teams and runners-up who demonstrate a solid plan for bringing an innovative product or service to market. The rigor of the competition maximizes educational value, prepares students for the realities of the business world and helps to generate new business opportunities. Sheehan Phinney’s attorneys represent clients in every aspect of business bankruptcy cases and other insolvency venues. The members of the Bankruptcy, Restructuring and Creditors’ Rights Practice Group and the firm’s broader business litigation team have extensive experience in handling appellate proceedings in the United States District Courts, Bankruptcy Appellate Panels and United States Court of Appeals, and Supreme Court of New Hampshire and the Massachusetts Supreme Judicial Court. Attorneys also serve as mediators, arbitrators or other facilitators to resolve actual or potential commercial litigation through alternative dispute resolution techniques. McLane Middleton provides expertise while keeping legal costs in check, by addressing matters promptly and effectively. The law firm assists clients with workplace audits, strategic workforce training, timely workplace investigations and more, in industries ranging from manufacturing to educational and technology business. The firm has substantial expertise in discrimination, harassment, disability, data privacy, drug testing, family and medical leave, federal and state regulatory compliance, OSHA, wage and hour, reductions in fore, immigration and more. McLane Middleton tax attorneys advise clients on a broad range tax planning issues including federal tax planning, retirement plans and employee benefits, employee stock ownership plays, executive compensation planning, state and local tax planning, tax controversy, tax-exempt entities and international tax planning. McLane’s tax attorneys also have the unique perspective of frequently participating in the drafting of New Hampshire’s tax legislation.